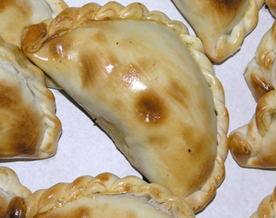 They are like a mini pastie.. filled with lots of different flavours. I am partial to the 'carne picante' (spicy meat) and the 'queso y cebolla' (cheese & onion) and the 'verdura' are also super yummy (vegetable-usually spinach and cheese). I just found this picture and it is exactly what they look like! they are 'muy rico' (very tasty)! Well, it has been a mighty big week! humungus mungus actually. But totally fulfilling and successful! Less than two weeks and Chris and I are off to the USA on the St George's College Gospel Choir Tour. Boston, New York and Washington DC is where we are headed- performing in different venues, universities and churches. It will be a lot of fun! There are two other teachers and 45 students from ES1-Poli 3 (Yr 7-12). This week however was so mighty because we put on a production in the theatre called 'The Big Sing.' It was a Vocal Showcase of choirs and vocal soloists. 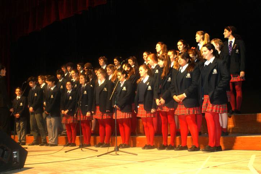 I had prepared Gospel Choir, Senior Vocal Ensemble, Prep Choir (primary) and the St Georgian Community Choir (Parent/Staff Choir) to sing on the evening. There were also student soloists and invited past students and from the St George's North campus. It was an hour and a half concert and it was a huge success!! It was the first time in 30 years that a production like this has happened- so I was told. Parents were beaming as their children sang and the talent and quality of singing was fantastic!! The kids shone! And I had the best seat in the whole house- standing right in front of each choir conducting them and singing all the words and pulling faces at the little ones so they wouldn't forget to smile as they sung! Overall such a joy! I'm so proud of all of them. They were incredible and it was a very magical and special moment to pull it altogether with the Creative Arts team here at school! Massive effort but an even bigger reward! Now it's the weekend and the sun is shining after a week of rain! Time to dabble in a bit more sleep and some relaxation and prep for all that is ahead! ooo, we are thinking of road tripping in a hire car that has a double bed in the back for a week after the USA also! Time to discover the country we have landed in! I will keep you updated on what we decided.